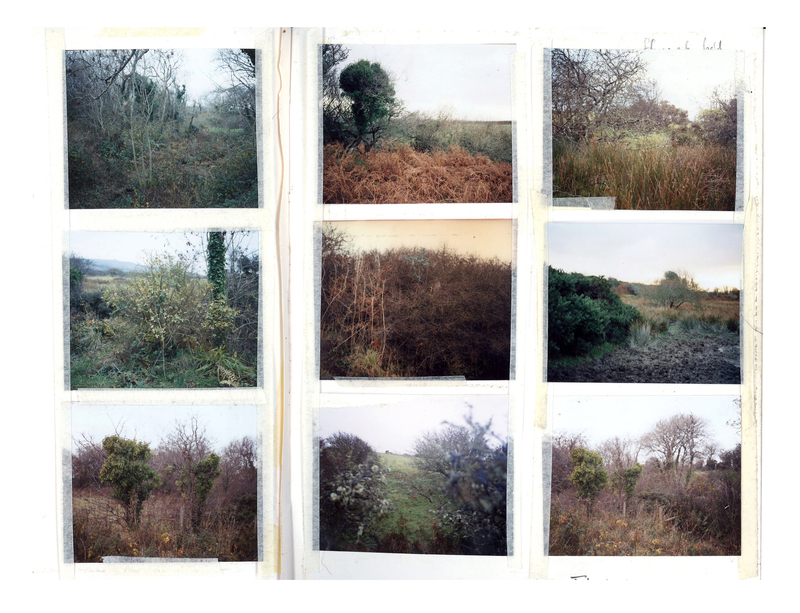 Alongside my large scale landscapes and studio photographs of found objects, I make less formal work in the shape of a scrapbook. It’s a little bigger than A5 and consists of 6×7” film contact prints, 6 to12 images to a page. The photographs are all taken around the small holding, Ffynnonofi, where I live and work in West Wales. 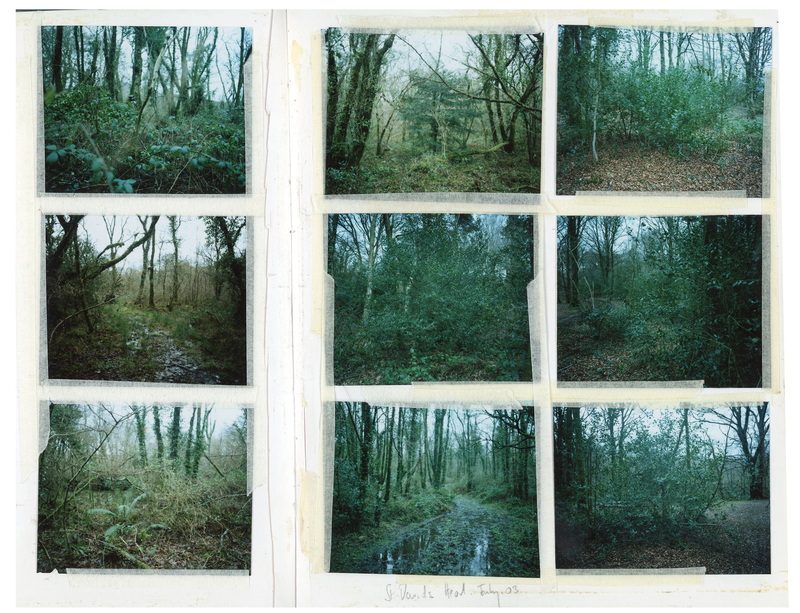 It was never conceived as a specific project or contemporary critique of the landscape, but more of a photo diary where I simply record colour, light, textures and the land that surrounds me. 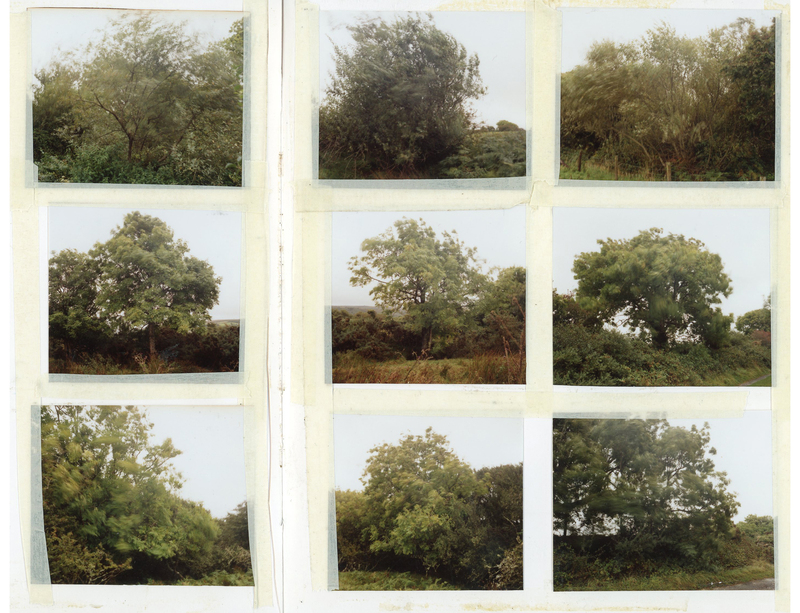 The 6×7” format allows me to shoot more freely than 10 x 8”, my preferred medium, and it’s become a useful reference for developing ideas and finding locations that I may want to return to. 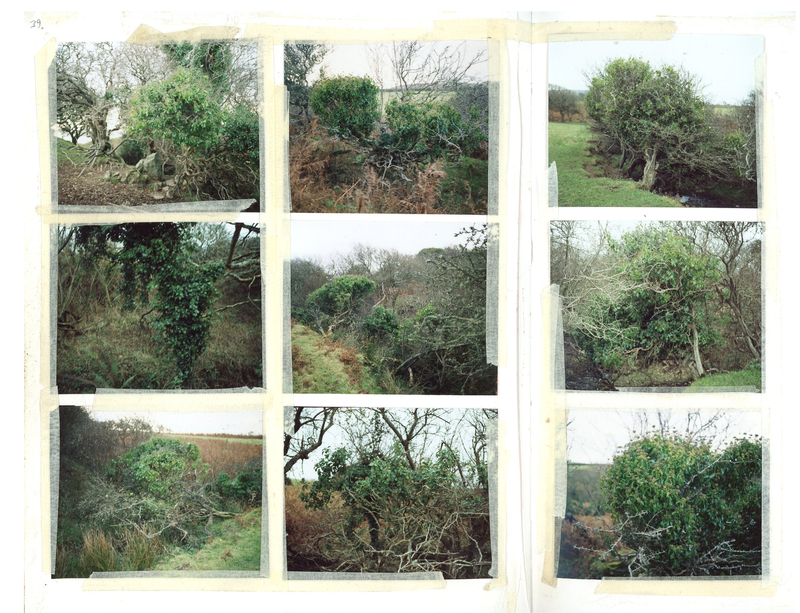 The North Pembrokeshire landscape has been familiar to me since I was a child. 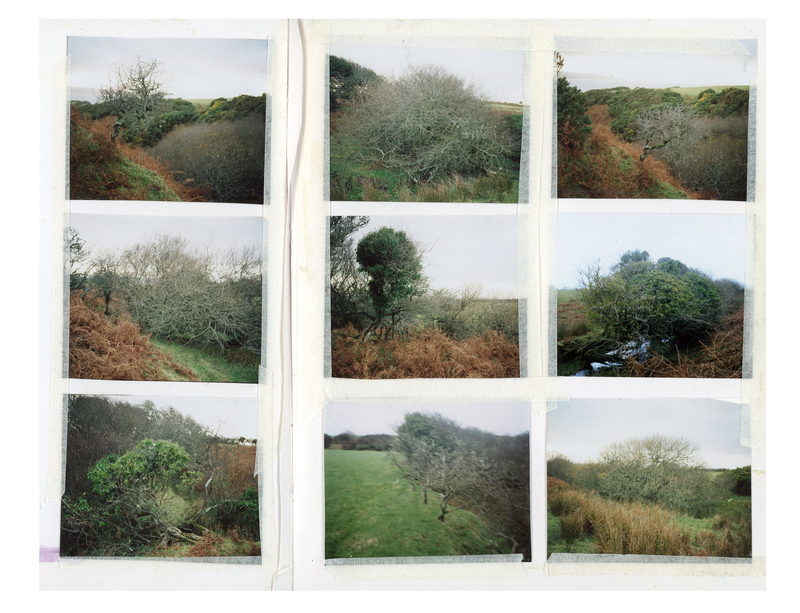 A place of thorny windswept native trees, dark hedgerows, thistle covered fields, gorse, and slate beaches. The soil here is poor and the species that survive the Atlantic winds (and the sheep) need to be tough rather than pretty. Most things don’t grow higher than a few metres. The farmland looks ragged and feels like it’s been left behind by the modern world of industrial scale fields, mega farms and Monsanto. It was Pembrokeshire’s ‘strange darkness’ that appealed so much to Graham Sutherland back in the 1940’s. This feels like home to me in way that the rich woodlands of Southern England don’t. I’m not looking for strong formal images or perfect moments. 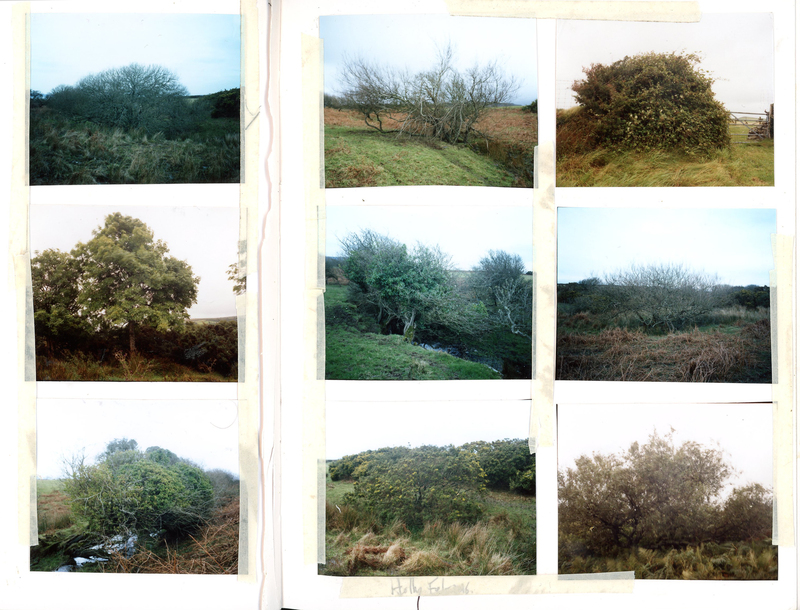 I’m simply documenting trees, bushes, grasses and mineral surfaces that make up the landscape. I shoot in a serialistic often repetitious way, returning to the same locations throughout the year. I tend to avoid the romantic glow of the ‘magic hours’ preferring duller overcast conditions or fading winter light where tones of colour are more important than shadows and high contrast. I mainly use slow rated portraiture film that often distorts in the low winter light. 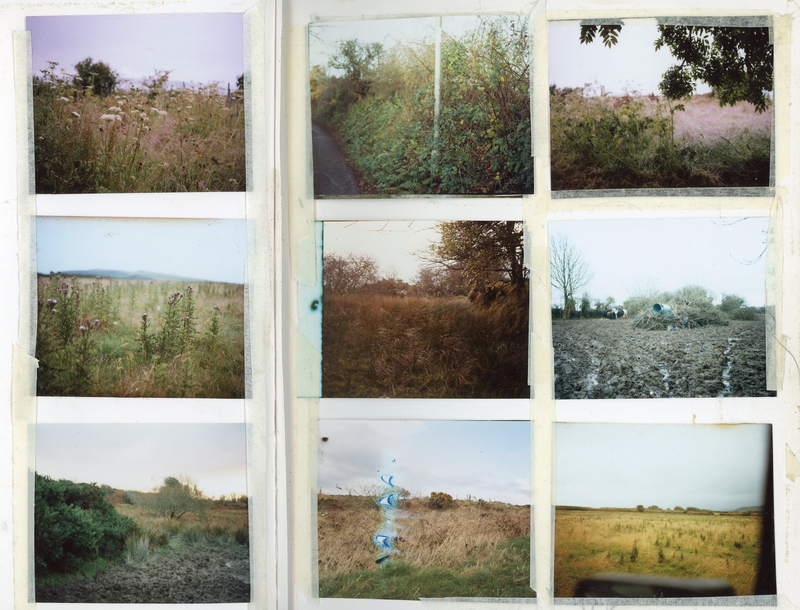 Increasingly, my work feels like a document of place in fragile and uncertain times. 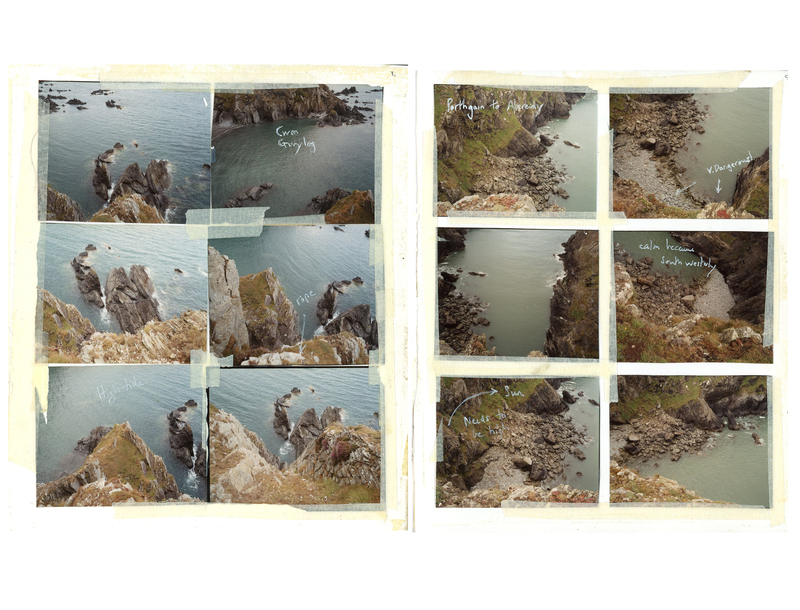 The scrapbook allows me to work with the painterly properties of film, whilst I’m working digitally on other projects. 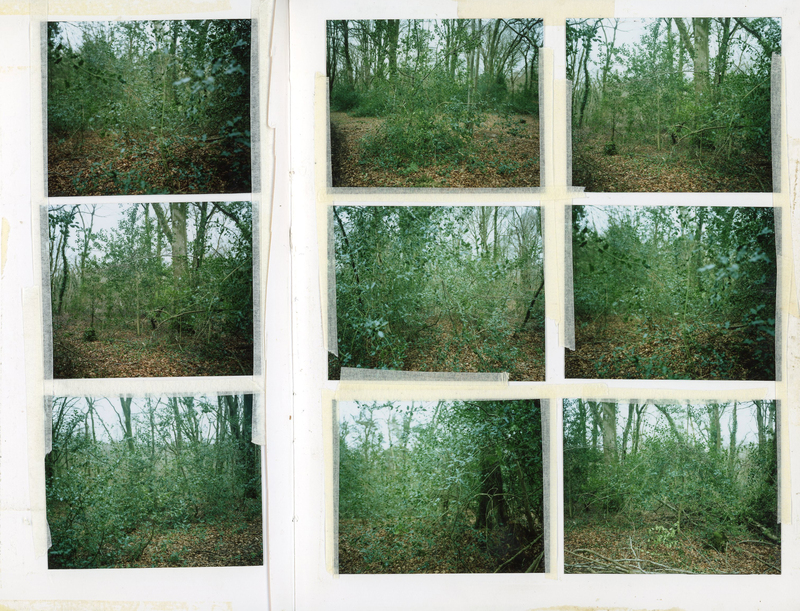 Digital technology, despite it’s huge gains in sharpness, software capability and ‘ultra real’ reproduction, cannot yet provide the depth of colour created by the layers of chemicals in the film negative. Also, in low light conditions digital camera movement looks like computer noise, whereas movement with film can create rich painterly effects. As digital technology improves rapidly the film negative increasingly feels like a distinct medium in itself. 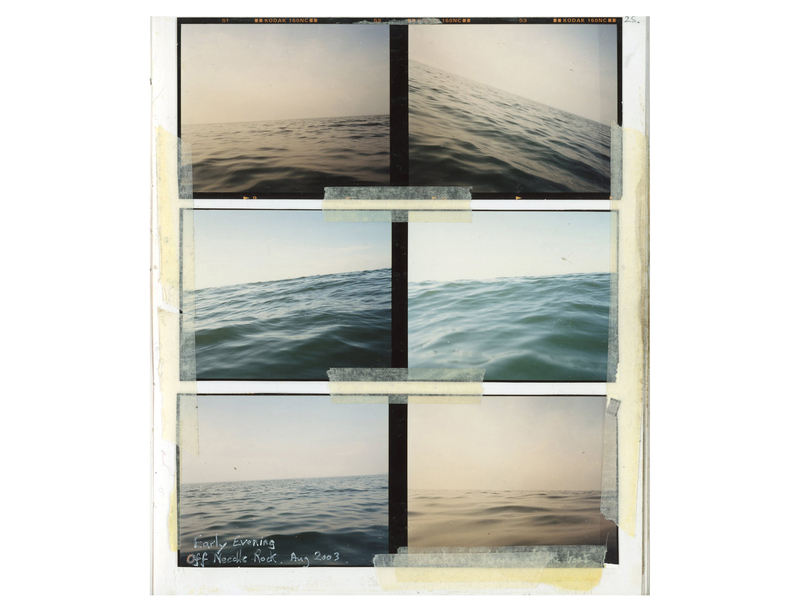 Tacita Dean demonstrates this so powerfully in her films. An important part of the process is in the editing, putting images and colour tones together and constantly moving things around. I prefer cutting and sticking down photographic paper than spending hours in photoshop because it feels more like making. I can take the scrapbook apart on a winters night and then put it back together in a different form the next evening. It is constantly changing as I change. 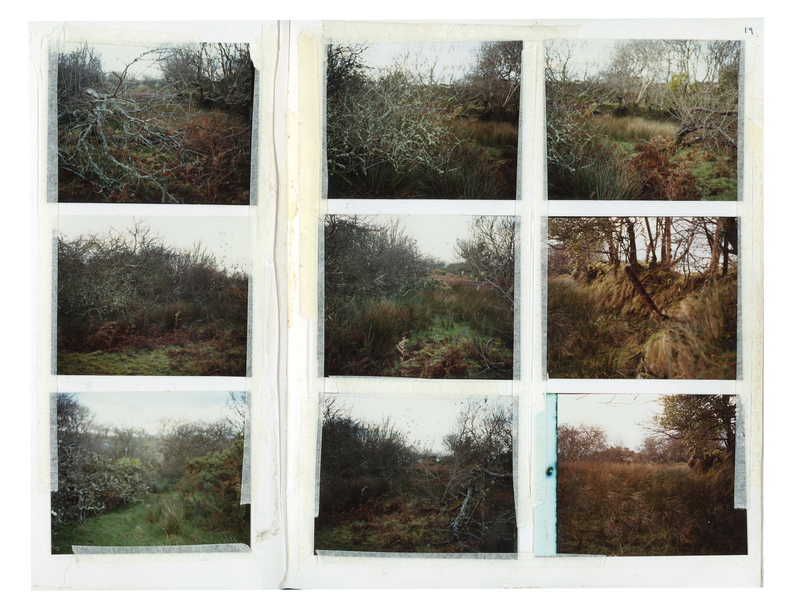 The loose grids of images reflect my interest in the idea of the ‘atlas’ and the way artists have represented and mapped the landscape in non linear unscientific formats. 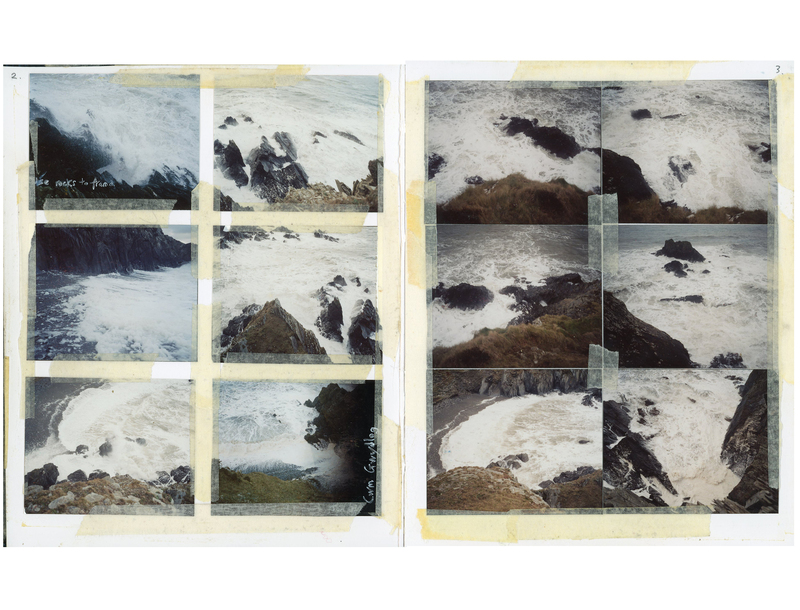 Olafur Eliasson’s photographs of Iceland, Gerhard Richter’s Atlas and Robert Frank’s Moving Out have all in their own ways been an influence. Perhaps I’m creating my own relationship to time and place and my own form of pseudo scientific study of a place. 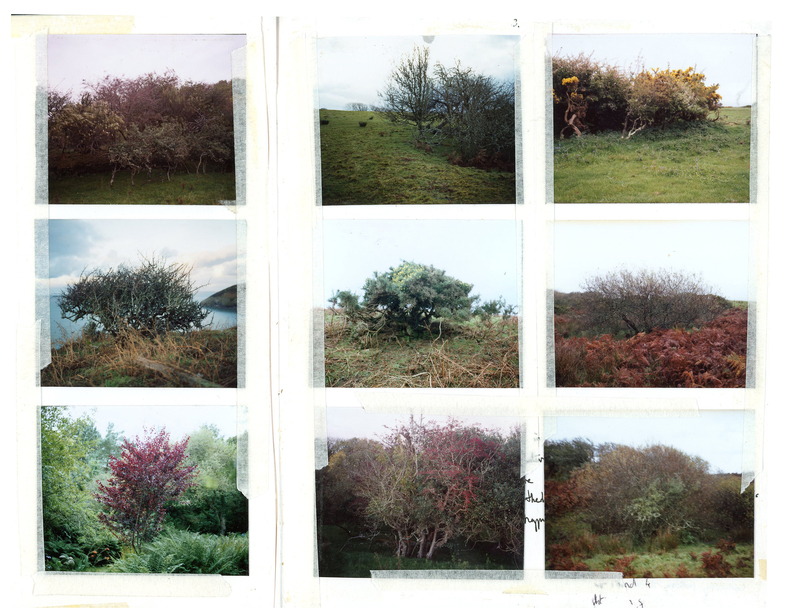 This ‘arrangement’ of nature certainly creates a personal and maybe a strange knowledge of place. 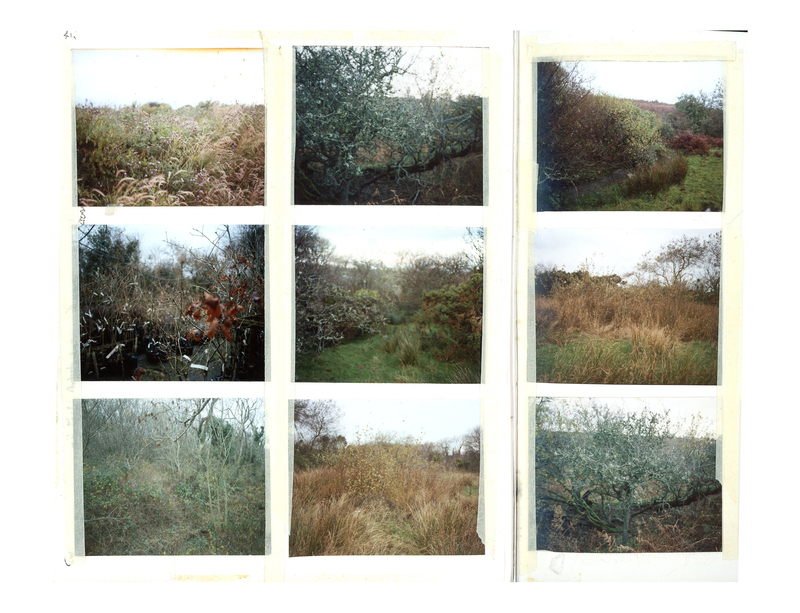 A boggy field or scruffy hedgerow is sufficient for me if the light and colours feel right. It’s ‘the rags and bones’ of the landscape as opposed to the drama and advertised beauty of the National Park that interest’s me. I like the idea of exploring the richness of this wet and boggy landscape. Of finding aesthetic sufficiency where you live, without having to travel to new and dramatic locations. 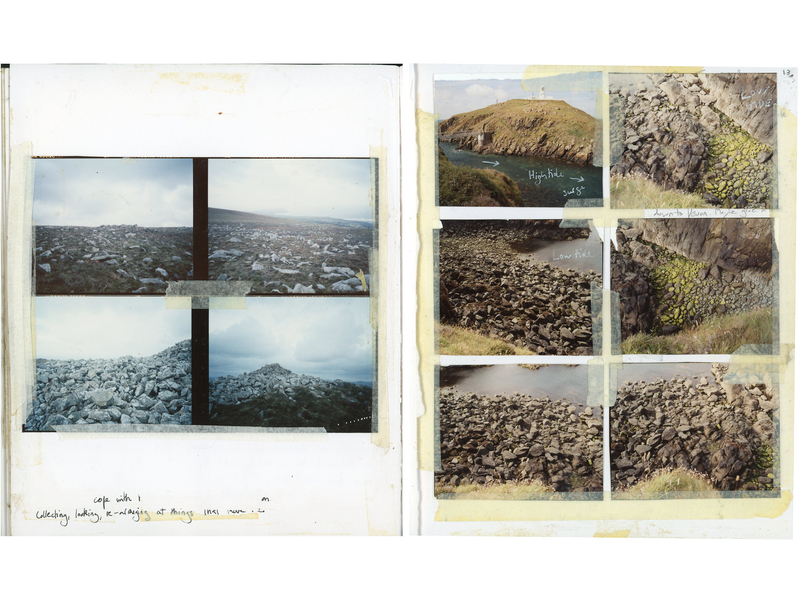 In his book, Joseph Beuys in The Celtic World, Beuys talks about ‘a light from the West’, and a ‘lore of places’ where one finds an ‘intimacy of human, natural and the divine’. I certainly feel an intimacy with the landscape here at Ffynnonofi. But it’s an intimacy that also sits alongside a melancholy. Not the melancholy that comes from nature’s indifference but from a knowledge that nature is under attack and that it’s natural transition is threatened by the stupidity of us humans.